Mr Verhofstadt, a former Belgian prime minister who supports a united states of Europe, could find himself as the first high-profile casualty of the upcoming Parliamentary vote. According to an EU Parliament sources, the high-ranking MEP will be discarded by Mr Macron as he installs an En Marche candidate as the institution’s liberal leader. The French President’s party are set to merge with Mr Verhofstadt’s ALDE group in the new Parliament. EU countries will elect a new batch of MEPs between May 23-26, forming the make-up of the Parliament until 2024. Mr Verhofstadt’s Open VLD party are only expected to return two seats in the European Parliament, which will put him in a significantly weaker position when negotiating his future role. A European Parliament source said: “En Marche will seek to get rid of him, Verhofstadt’s position is becoming increasingly untenable. Mark Rutte, whose MEPs are in the liberal bloc, is also understood to be planning a move against Mr Verhofstadt, who has become an increasingly divisive figure throughout the Brexit negotiations. The Dutch prime minister is said to be largely “incompatible” with his Belgian liberal colleague. The growing list of opponents will likely prevent Mr Verhofstadt from gaining the support for an alternative role as Parliament president. During an EU Parliament debate on the Brexit delay today, Mr Verhofstadt appeared to side with Mr Macron’s stance on ensuring Britain leaves the bloc as soon as possible. Despite opposition from the French President, EU leaders agreed to offer Theresa May a flexible extension until October 31. 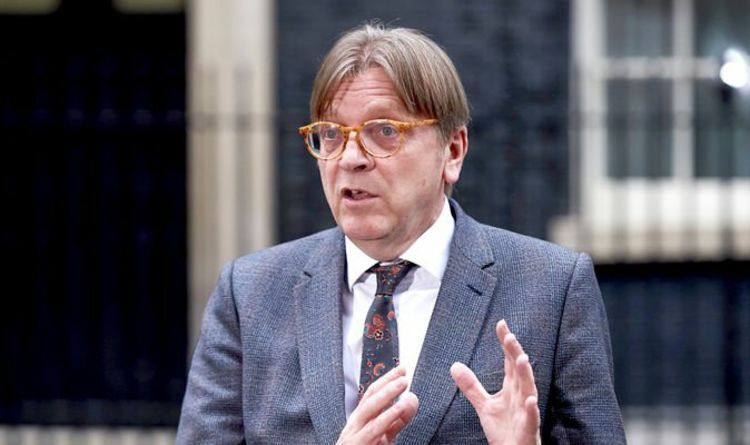 Mr Verhofstadt criticised EU leaders for risking the bloc’s unity and health by kicking the Brexit can down the road. He suggested that EU business would get bogged down by never-ending Brexit negotiations led by either Jeremy Corbyn or Boris Johnson. He told MEPs: “My fear is that with this decision the pressure to come to a cross-party agreement disappears, has weakened the last days, and both parties conservatives and labour will again what they did already for months - run down the clock. The proof of this - the first decision the House of Commons has taken after your decision was to go on holidays. “I never thought I should say that in my life but maybe the only thing that can save us is Nigel Farage now. Today he's already campaigning, he's already rallying with the new party the Brexit party, catching up with the Conservatives in the polls and the old parties risk to be wiped out during the election. So my advice is that if they are not stupid both parties, they'll make a cross-party deal now immediately in the coming days to avoid this imminent disaster.